Support your candidate by stopping John McCain! Brother Huck’s Travelin' Salvation Show! Hunter on top in Nevada! Capitol Hill staffers rate their bosses. McCain got no glory from those who work with him. McCain’s the candidate of amnesty for illegal aliens. McCain supports embryonic stem-cell research. McCain has said “I would not support repeal of Roe vs. Wade”. McCain opposed the Bush tax cuts, and refuses to sign the “No New Taxes” pledge. McCain supports legislation that would increase taxes on energy. 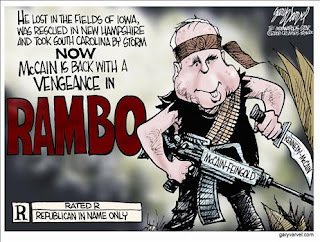 McCain was the ring-leader of the Senate “Gang of 14”, which kept the then Senate Republican leadership from ending the ability of Democrats to filibuster Bush’s judicial nominees. McCain supports legislation to grant due-process rights to terrorists. McCain called evangelical-conservatives an “evil influence” on the Republican Party. McCain - member of the Keating 5 that caused a bipartisan scandal during the S&L meltdown. McCain had a recall election ran against him by the conservatives in Arizona. McCain blocked the investigation into whether Viet Nam and the Soviets were still holding over 600 of our missing POWs in 1990. How Good Are The Promises of Each Candidate to PROTECT Workers, Communities and Taxpayers FROM ILLEGAL & OVER-IMMIGRATION? McCain is an absolute abysmal imbosol!! He’s a RHINO republican and tried to shove amnesty down our throat 2 times with "HIS OWN BILL". HE IS FOR TAXING USA companies only to solve a so called GLOBAL warming problem. Well what about the rest of the WORLD? You people drink the kol-aid of the press and are completely UNINFORMED. ROMNEY is this COUNTRYS BEST HOPE. You want to know something else, STUPIDY BREADS ITSELF. You will believe anything someone tells you if you are uninformed and that is what the liberal media is counting on. John McCain should be renamed as JUAN McCain. Have you noticed who his heading up his HISPANIC outreach group for this race. If not, Google "McCain and Dr. Juan Hernandez. I WILL NOT, SHALL NOT AND CAN NOT VOTE FOR JUAN McCain, I would rather the Republican Party dissolve, period! 1. John McCain teamed with Ted Kennedy and attempted to give amnesty to every illegal alien in America, and even wished to grant them access retroactively to Social Security benefits accrued under illegally used numbers while here against the current law. 2. John McCain (along with the regular cohort of lefties) removed your right to speak out against political candidates (including him) through advocacy ads in the 30-60 days before a primary or general election. The infamous McCain-Feingold legislation proves he couldn't find an originalist judge if the man was sharing a pair of pants with him. 3. John McCain considered leaving the GOP to become an independent caucusing with the Dems, and only balked when Jeffords beat him to it. Daschle and others swear its true. 4. John McCain proved himself to be a populist anti-capitalist when he called the pharmaceutical companies "the enemy" during the most recent South Carolina debate. George Will is even wondering why John is a Republican and hasn't switched yet. 5. John McCain has swallowed the "Man Made Global Warming" pill whole. He has teamed with Lieberman to offer legislation to create a carbon cap and trade system that the Congressional Budget Office believes will add energy costs to each family of between $560-1800 per year, with the money raked in dispersed out in R&D grants, or government pork barrel goody contracts as I interpret it. 6. John McCain voted against the "Bush" tax cuts more than once, voted for amendments to keep the death tax alive, and along with our faithful Governor Pawlenty calls huge tobacco tax increases "fees". 7. John McCain believes waterboarding for US Servicemen is normal during training for capture situations, but calls it unconscienable torture when applied to important organizational terrorist figures caught plotting to kill Americans. This American serviceman disagrees. 9. John McCain has stated he would vote for the international anti-sovereignty Treaty of The Seas if it was "tweaked" a little. This compact would give an international body the jurisdiction to dictate naval forces movement, oceanic weapons and technology testing, and set and collect fees and divy up rights and royalties to all energy resources found and recovered at sea in current international waters. One country, one vote. How do you think Iran would vote for our rights to traverse the Straits of Hormuz? 10. Midwest Jay really can't stand the guy, and he reminds me too much of a pissed off Huck-a-jerk without the Chuck Norris sidekick. Leading a fighter squadron gives you leadership experience to lead a fighter squadron of 24 guys. Reagan made war bond films. Who cares. American hero or socialist? Probably both.